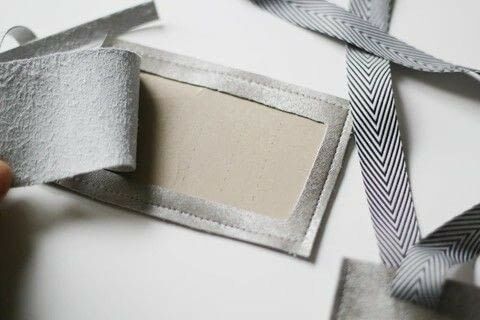 https://www.cutoutandkeep.net/projects/faux-leather-luggage-tags • Posted by Sanae I.
Faux leather and leather seem intimidating to sew, but as long as you take your time, there's nothing to fear! I made these luggage tags for a friend as a going away present and she said they stood out in a line-up of black suitcases. Make them in bright faux leather for added pop! Measure out the size you want on the wrong side of the faux leather. Mine were approximately 3.5in x 5.5 inches. Cut out two pieces of faux leather. Make any cutouts necessary for the ties and flap. Faux leather doesn’t fray, so no need to worry about finishing raw edges. Sew with a leather needle and go very, very slowly because this material stretches as you sew. If you have a walking foot, definitely consider using it. Using an adhesive like tacky glue to bind the two pieces before sewing is also helpful, but keep in mind that your needle may get gunked up. Trim edges to line up if the fabric pieces shifted while sewing. Insert a handmade info card and slip on a ribbon or ties, and voila! Luggage tags in less than 30 minutes (if you don’t use any glue). 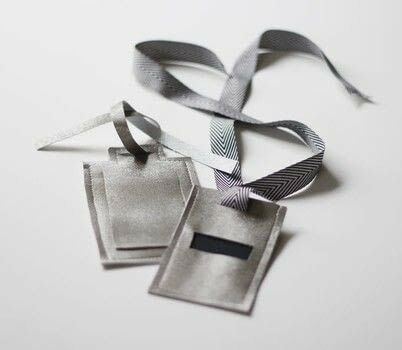 Add a piece of ribbon or thin strip of faux leather so the fancy luggage tag can be tied onto your nondescript suitcase.